Head back to nature and head to the hills for a picnic among the trees. The Cumberland State Forest is one of the last untouched havens in the Hills District. Drive in and you immediately feel the hustle and bustle of the city disappear as you immerse yourself in the trees, and at times the enchanting mist. Pick your perfect picnic spot, be it the grassy patch near the pond, I maintain this is the original home of Shrek, or head past the 'swamp' to the majestic trees of Palm Gully and take in their fresh scent as you unpack your lunch. Watch the kids run around the trees and cook up a barbie of your favourites. Watch out for the birds though, who may want to join you. 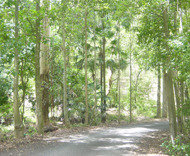 After lunch in the beautiful surrounds, either jump in the car and take a drive or head off down one of the many bush tracks available and experience the bush and all it has to offer. Keep your eyes up and you may see one of the many bird species popping their heads out of the home. For a lighter stroll through the trees choose the Sensory trail and see, touch and smell your way through the forest with the kids. If a light snack is all you're after, travel down the track to Café Salinga for a scrumptious bite to eat or enjoy a coffee and cake in the warm sunshine. Take you own piece of the Australian bush home from the Native Nursery offering a vast rage of native plants and shrubs. An education centre for the kids with hands on activities, your choice of 4 picnic and BBQ areas and a peacefulness you will be sure to add this enchanted forest to your list of favourites. Escape the city in an instant and relax in the greenery of the forest.